Biscuits aren’t biscuits in Australia. In Australia “biscuits” are cookies, and they don’t have anything like American biscuits. In America, biscuits are served instead of bread rolls with some meals. They’re scone-like, hearty, buttery, and are an amazing comfort food. 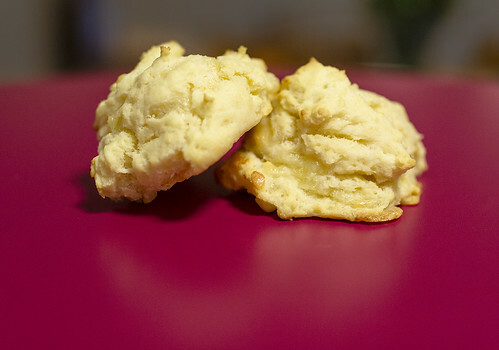 Drop biscuits aren’t kneaded or cut into circle shapes like some biscuits are. They’re by far the simplest type to make, and this recipe goes a step further by even cutting down on the number of ingredients that most recipes have. These are delicious as a side with bbq chicken, roasts, or even for breakfast with eggs. I was looking through recipes for these and wondering why they had so many ingredients. I gave it a try with just the basics and it’s better than anything else I’ve tried! 3. In a mixing bowl, mix together the flour, milk, cheese, and butter. 4. Line a baking tray (cookie sheet) with baking paper (wax paper). 5. Form the dough into 12 roundish mounds. They don’t need much space in between as they don’t rise much. 6. Bake for 10-15 minutes until golden brown. 7. Let cool for 10 minutes on a cooling rack before eating.